At the very beginning of Pramoedya Ananta Toer’s novel, This Earth of Mankind (1980), the Javanese narrator and protagonist, Minke, introducing his younger self as being in awe of “modern” technology, singles out one product as especially marvelous: “one of the products of science at which I never stopped marveling was printing, especially zincography. Imagine, people can reproduce tens of thousands of copies of any photograph in just one day: pictures of landscapes, important people, new machines, American skyscrapers.” This classic colonial encounter with the “modern” also presents an important puzzle about the way postcolonial literature engages the global scale and critical form of world literature. Whereas the space of print is presented as the universalizing measure of the modern world, the printed word has been eclipsed by the photographic image. Minke’s encounter with the marvel of modern print presents both a problem and a model for addressing the critical question of reading today. The printed page demands a kind of close reading (I’ll call it nearly reading) that simultaneously attends to the material medium of print and reads for the range of different cultural forms displaced by print technologies. A model of reading is required that can measure the global scale of literature in critical relation to the economic world-system that has displaced literary forms worldwide. The kind of reading implicit in the work of Pramoedya (and other writers and theorists of decolonization) demands a return to philology even as the traditional object of philology is displaced. Postcolonial philology enacts a return to nineteenth-century European comparative philology (everywhere evident, for example, in the work of Edward Said; and something that has been emphasized, more recently, by Aamir Mufti). The theoretical and practical example set by European, colonial “comparative philology” paradoxically provides the resources to address the problem of global scale and critical form in postcolonial perspective. This is not to say that the monuments of European philology somehow escape the colonial ideology and imperial assumptions of their time. Far from it. Just about everything to which an English reader has privileged access is dominated by colonial prejudices: from the canonical texts of world literature, through the critical commentaries on those texts translated from multiple languages, and including the dictionaries and glossaries still used to measure the linguistic, literary, and cultural significance of those texts in global perspective. It is those very colonial prejudices that point the way to a postcolonial model of (nearly) reading. Such a model is already embedded in the gaps and silences of the archive produced by comparative philology in its high colonial heyday. So, too, a postcolonial model of (nearly) reading is embedded in the theory and practice of close reading. Twentieth-century literary criticism inherited close reading from nineteenth-century comparative philology; and both its limitations and its strengths anticipate the models of postcolonial critique we see flourishing in a variety of forms and under a variety of guises today. All the critical forms of close textual analysis that might loosely be grouped under the rubric of “close reading” (including the rather different claims of “surface reading” taken up by Nicole Rizzuto in this cluster) develop practices and techniques of reading informed by what I call postcolonial philology. In the conclusion to The Passage of Literature, I schematically outline three imperatives informing the way postcolonial philology grasps the individual passage of text: 1) each passage of text emerges from a translation between languages; 2) each passage of text emerges from a dislocation of material culture; and 3) each passage of text harbors a potential reversal of historical perspective whereby the colonial field of reference is recognized as being premised on a logic of decolonization. Here I want to single out for further consideration the second imperative. In what sense does the material dislocation of culture offer a model for reading the global scale and critical form of literature? This is the question posed by Minke’s encounter with the marvels of print technology. Minke’s dilemma draws attention, primarily, to a dislocation of languages and literatures. In erasing the forms of Javanese language and literature associated with Minke’s aristocratic heritage, technologies of modern print culture precipitate a familiar dialectic of political awakening: initially rejecting the traditions of his Javanese culture in favor of the colonizing language and culture of Europe, Minke will discover the revolutionary potential of modern print form as a vehicle for organizing anti-colonial nationalism. According to this dialectic, the material displacement of linguistic and literary forms by the photographic image (recalling Walter Benjamin) initiates a further engagement that comes to define the linguistic and literary medium of Minke’s unfolding bildungsroman. Minke has yet to learn the importance of that linguistic and literary medium of print—the newspaper (but also the novel, the medium of Pramoedya’s own writing); and, above all, the new language, bahasa Indonesia—for imagining Indonesian anti-colonial nationalism. However, if the young Minke has yet to arrive at that conception of “world literature” anticipated by Johann Wolfgang von Goethe, reformulated by Karl Marx, and still debated today (often with passing reference to Benedict Anderson’s argument about the role of “print capitalism” in the forging of modern “imagined communities”), the tetralogy of novels that traces Minke’s political awakening (and that of Indonesian anti-colonial nationalism) tells the story not so much of the success of this discovery, but rather of its failure—the missed opportunity to realize “world literature.” The whole of the Buru tetralogy is premised on a retrospective examination of this moment, its readers always in the position of nearly reading what Minke has not yet discovered in his encounter with the modern space of print, “print capitalism,” and the politics of decolonization. This missed opportunity foregrounds a material dislocation of culture that is both a problem of reading and a model, the model of nearly reading the space of the printed page as a global measure of world literature and the economic world-system. As Minke’s enthusiasm for print technology suggests, the literary form of hegemonic world literature is eclipsed by the very medium that seems to make it the universal measure of colonial modernity. It is not simply Javanese (as language and literature) that gets eclipsed in Minke’s inaugural encounter with the modernity of print form; it is all forms of the printed word, including European literary forms. The contest over linguistic, literary, and cultural forms it inaugurates hinges on the material dislocation of literature worldwide. Hence the paradox that world literature is the worldwide realization of an eclipse of literary form. The material medium of print literacy becomes the riddling afterimage of this measure of world literature. Each passage of literature henceforth enacts the “passage”—disappearance and eclipse—of the multiple and contested forms of linguistic and literary culture to which it testifies. Eclipsed first by photography and film and then by digital media (as described by a range of media theorists including N. Katherine Hayles and Lydia Liu), the medium of print today presents a puzzle of reading very much linked to Minke’s enthusiastic embrace of the marvelous technology of print. The fundamental nature of reading has changed, and with it, the fundamental elements by which to measure that transformation—letters, words, literary form. How, then, do we read what is literally vanishing before our eyes? Fig. 1. 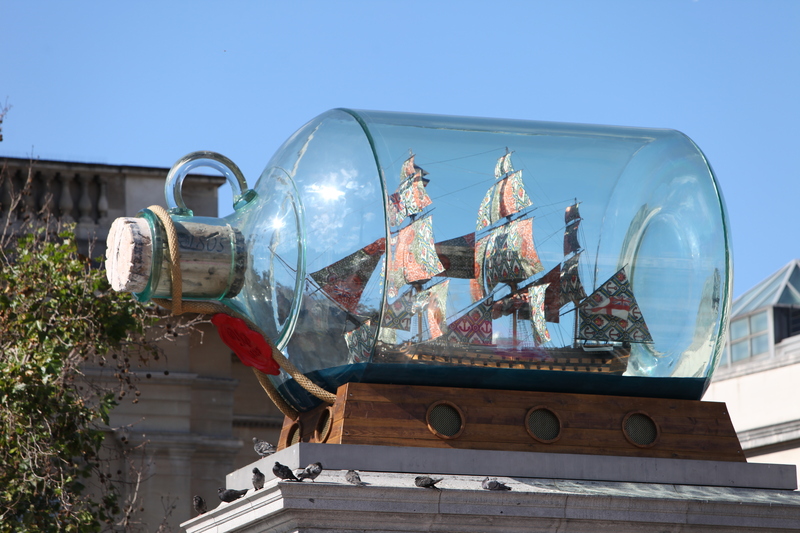 Yinka Shonibare, Nelson's Ship in a Bottle, 2010, London. The sculpture considers the relationship between the birth of the British Empire, made possible in part by Nelson's victory at the Battle of Trafalgar, and multiculturalism in Britain today. Courtesy Wikimedia Commons. Lisa Lowe’s The Intimacies of Four Continents provides an instructive answer to this question in her focus on the way textiles and fabrics encode “layered histories” of labor and production linking the “four continents” of Africa, Europe, America, and Asia. In the material histories of these textiles and fabrics, Lowe finds “the intimacies of four continents” that have been occluded by the canonical texts of the “liberal archive.” One of the models for the reading practice she employs is the work of the British-Nigerian visual artist Yinka Shonibare, whose Lord Nelson’s Ship in a Bottle illustrates her book cover. By refashioning the ship’s sails “in fabrics brightly patterned after Dutch wax Indonesian batiks that one now associates with African dress,” Shonibare’s work, according to Lowe, “creates a new ‘grammar’ for referring to the concealed histories of empire, slavery, and migration that linked the trades in goods and peoples between Europe, Asia, Africa, and the Americas” (Intimacies, 135). In a sense, Lowe asks us to read every passage of literature—each text in the “archive of liberalism”—for the Dutch wax print design hidden, or displaced, by the space of the printed word (4). There is more than a metaphorical link between Shonibare’s use of batik material and Lowe’s practice of reading. Both are concerned with the material cultural history of textiles and the global forms of trade in objects and people embodied in that material history. In a chapter devoted to reading William Makepeace Thackeray’s Vanity Fair (1848), Lowe reads the novel’s references to chintz and calico fabrics as “both acknowledg[ing] and disavow[ing] the complicated history of Indian labor and East Indies trade” (92). Chintz and calico fabrics are characteristic tropes marking the familiar space of domestic interiors in the Victorian novel and Lowe examines specific examples from Vanity Fair. In all these examples, however, the links between a whole range of different laboring groups have been displaced to create a racialized sense of bourgeois interiority, identity, and intimacy, that occludes what Lowe calls “the intimacy of four continents.” Lowe follows the example of Shonibare’s “new grammar” to show how references to chintz in the Victorian novel can be read in ways analogous to the “iconic yet contradictory object” of Shonibare’s ship—“at once preserved in the finite space of the bottle, but imprinted by dyes, stains, and wax patterns that attest to stolen arts, bodies transported, and the intimacies of trade in goods and peoples” (137). Lowe’s critical practice of reading combines tools of close textual analysis, materialist critique, and cultural analysis that might be considered state of the art in the discipline of literary studies. Yet there is something old, too, about this reading practice. Her book returns to C. L. R. James and W. E. B. Du Bois, whose work embodies an experience of decolonization as a long revolutionary durée of history yet to be reckoned with. It is through C. L. R. James that Lowe has us read the chintz of Thackeray’s Vanity Fair. James’s claim for a greater affinity to Thackeray than to Marx provides the model for a reading of commodity fetishism in Vanity Fair in terms of the “intimacies between colonial commodities” linking Africa, Asia, and the Americas (73). This older way of reading draws on an experience of decolonization that brings renewed attention to what is occluded in canonical texts. Perhaps we might say that the material history of those colorful Dutch wax prints used for the sails of Shonibare’s ship is already there in the interior spaces of Victorian novels. It’s just that it's not yet been read. Similarly, it has long been recognized that the global trade in textiles was a determining feature of the modern economic world-system; less well recognized is the extent to which the history of that trade has been misread as a story of Europe’s centrality to the modern world-system. Following historians such as Prasannan Parthasarathi, as well as the model of Shonibare’s use of batik material, Lowe emphasizes the extent to which we are still in the position of nearly reading, from the significance of print textiles, the intimate networks of trade across four continents. We can still be guided by the models of reading provided by such figures as C. L. R. James, W. E. B. Du Bois—or, indeed, Pramoedya Ananta Toer. In his introduction to an anthology of texts from the turn of the century—texts he called “pre-Indonesian literature”—Pramoedya wrote “What is published here has not yet for certain been read, but what is read here has already for certain been published.” Pramoedya is here referring to a specific kind of document: works printed in a form of Malay, published in colonial newspapers (usually run by Chinese Indonesian owners), written by writers and journalists from a wide variety of different linguistic and ethnic backgrounds (Dutch, Indo, Arab, Chinese, Malay) and targeting an equally diverse readership across the Dutch-controlled East Indies. Reprinting these documents, Pramoedya sought to revisit an important moment of print culture in the history of the emergence of the Indonesian language and nation, making available documents that had either been forgotten or deliberately erased from the colonial archive. It is this occluded history of print that the Buru tetralogy itself continually revisits as it measures the gap between the fictional Minke and the historical Tirto Adi Suryo, a journalist, writer, and forerunner of Indonesian anti-colonial nationalism. The fictional Minke has not yet discovered the political significance of this space of “pre-Indonesian literature”—and, indeed, by the time the Buru tetralogy catches up with the historical Tirto Adi Suryo, we learn that the actual historical figure was exiled, his journalist activism subverted, and his documents appropriated and effectively erased from history. It is in this sense that a reader of the Buru tetralogy is always nearly reading the documents of early anti-colonial nationalism. This model of nearly reading—of reading texts that were for sure published but that have not for sure yet been read—has a place side by side with the models of reading Lisa Lowe draws from James and Du Bois. The model complements, too, the reading practice Lowe patterns after Shonibare’s use of batik material. In the middle of This Earth of Mankind, in a passage that echoes his opening encounter with print technology, Minke finds himself dressed the part of a Javanese knight to serve as translator between his father (a high official) and the colonial administrators. Measuring the impressively Javanese look of his clothes against the global history of their production, he seems fully aware of his place within the “modern” world-system: “I considered my clothes and my appearance to be products of mankind’s earth at the end of the nineteenth century, the time of the birth of the modern era” (Pramoedya, Earth of Mankind, 133). This passage even provides a useful lesson in the historical displacement of Southeast Asian textile industries: “The town of Twente in Holland now wove for the Javanese, and chose the material too. Village-woven cloth was left now only to the villagers. The Javanese were left with only batik-making” (133). If Minke knows here how to read the modern world-system of textile trade that clothes him in batik, he has not yet learned how batik is bound up with the political awakening he will undergo. Minke’s involvement in political activism on an Indies-wide scale takes place at the intersection of two forms of print industry, that of print journalism and print textiles, specifically the batik industry. The activist union organizing demanded by the latter (leading Tirto Adi Suryo to organize the batik trade union, Sarekat Islam, the first native Indonesian political movement) coincides with the ability to reach an Indies-wide mass readership offered by the former (in the form of the first native-owned newspaper, Tirto's Medan Prijaji). It would be revealing to explore the affinities between this activist history and the story of Gandhi's printing press in South Africa, as told by Isabel Hofmeyr, especially since this suggests a parallel between what I’m calling “nearly reading” and what Hofmeyr calls “slow reading.” (Such a comparison might also remind us of Laura Doyle’s call for us to reflect on the scale of “inter-imperial time.”) Just as Minke has not yet learned how to read the space of print, so, too, he has yet to learn how to read the full significance of batik. This apprenticeship in reading belongs as much to the figure of Minke as it does to the reader of the Buru tetralogy, measuring that political awakening in fictional form against the elision of that history from the colonial and postcolonial archive of Indonesian history. Batik indexes a politics of anti-colonial organizing to come that links the textile industry and the newspaper publishing industry. We still seek models of reading that can evaluate the riddle of this dislocation of material print culture. Lisa Lowe’s focus on the material history of the textile trade calls attention to the kinds of reading that might be made part of that measurement, or assessment—or nearly reading—of the world-system. Fig. 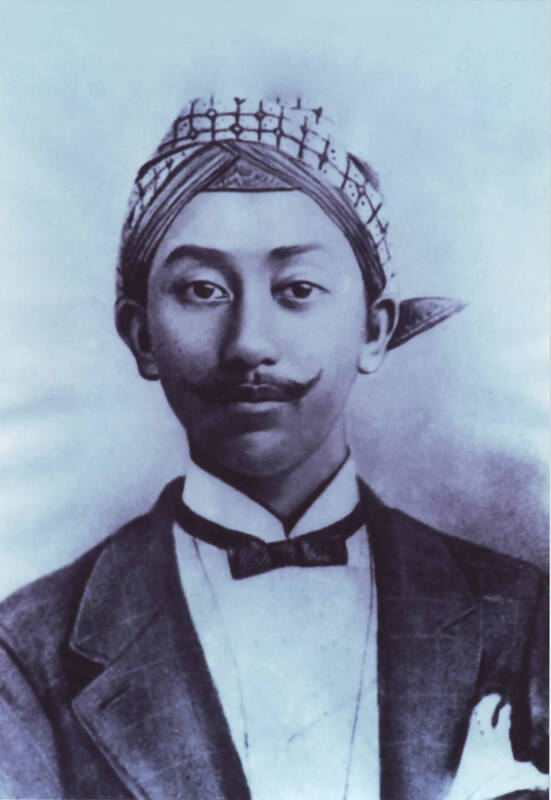 2 Tirto Adi Suryo (1880-1918), the model for the character of Minke in Pramoedya's Buru Quartet. Courtesy Wikimedia Commons. Lowe reminds us that the English words “chintz,” “calico,” and “gingham,” (if not yet “batik”) carry the residue of a “layered history of displacement and production” (Intimacies, 92). Here, Lowe returns us to the nineteenth-century discipline of comparative philology. Famously, “chintz, calico, and gingham” feature in Hobson-Jobson (1886), the Anglo-Indian glossary that appeared alongside (and as a kind of sibling archive to) the Oxford English Dictionary. Hobson-Jobson introduces precisely these three words in the first paragraph of its Introduction as examples of those “outlandish guests” whose appearance the glossary is designed to track—“Words of Indian origin have been insinuating themselves into English ever since the end of the reign of Elizabeth and the beginning of that of King James, when such terms as calico, chintz, and gingham had already effected a lodgment in English warehouses and shops, and were lying in wait for entrance into English literature.” Though not explicitly citing Hobson-Jobson, Lowe invites us to read against the grain of that colonial archive: “British cottons both acknowledged and appropriated the global history of cotton fabrics from the Indian subcontinent . . . identif[ying] the English manufactures by the Asian names for the print, dye, or method of production” (Intimacies, 92). Hobson-Jobson nearly points to the significance of Javanese “batik” (albeit mostly as a gap in its archive) that Lowe underscores in explaining Shonibare’s Dutch wax print sails: “Dutch and British companies appropriated the batik designs originally handmade in Indonesia and mass-produced them in Europe using roller print machines and dye-resistant resins, for export to foreign markets including West Africa, where they became popular and were appropriated anew” (136). Fig. 3. 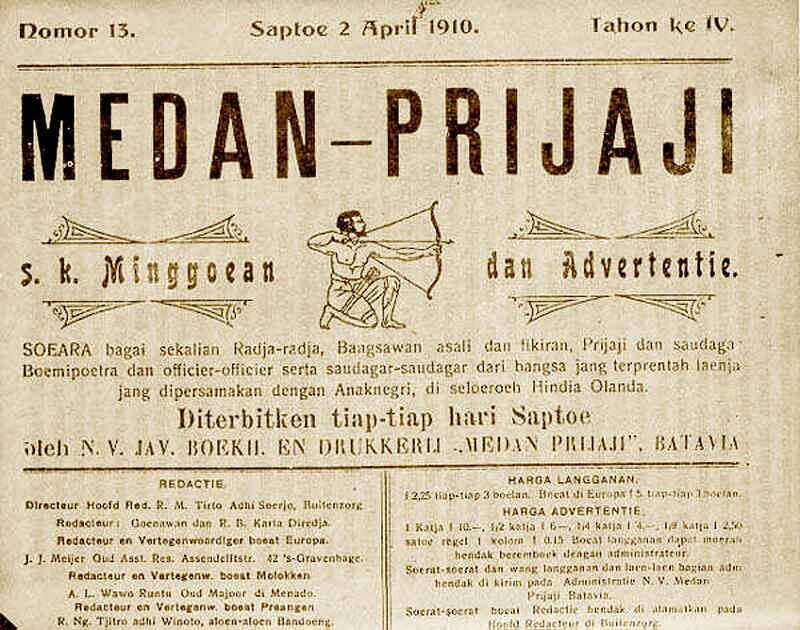 Front page of the 2 April 1910 edition of Medan Prijaji, a Malay-language newspaper and the first native-owned newspaper in the Dutch East Indies. Courtesy Wikimedia Commons. The history of this experience of decolonization might (nearly) be read in the canonical texts of European modernism and modernity. We can read it, first, by returning to the model of such figures as James, Du Bois, and Pramoedya. We can read it, also, by returning to the premises of comparative philology, in the material linguistic and literary evidence of words. It is perhaps most evident in the material dislocations of culture marked by the interrelation between text and textile print forms. The reason to call this nearly reading is to emphasize that a fuller anti-colonial reading has yet to be realized, while at the same recognizing this as the very condition for reading the text itself. As a matter of theory and practice, the reading of any passage of text enacts the very problem of global scale and critical form it seeks to measure—nearly reading what has yet to be seen, but has already been lost to view; nearly reading what for sure has already been printed but what has not yet for sure been read; nearly reading what links the modern world-system of textile printing with the modern world-system of print literacy. See Edward Said, Orientalism (New York: Vintage, 1979) and Culture and Imperialism (New York: Vintage, 1994); see also Aamir Mufti, Forget English! Orientalisms and World Literatures (Cambridge, MA: Harvard University Press, 2016). Christopher GoGwilt, The Passage of Literature: Genealogies of Modernism in Conrad, Rhys, and Pramoedya (Oxford: Oxford University Press, 2011), 215–53. See Walter Benjamin, The Work of Art in the Age of Its Technological Reproducibility, and Other Writings on Media, trans. E. F. N. Jephcott, ed. Michael William Jennings, Brigid Doherty, Thomas Y. Levin (Cambridge, MA: Harvard University Press, 2008). See Benedict Anderson, Imagined Communities: Reflections on the Origin and Spread of Nationalism (London: Verso, 1991). See Lisa Lowe, The Intimacies of Four Continents (Durham, NC: Duke University Press, 2015). See Prasannan Parthasarathi, Why Europe Grew Rich and Asia Did Not: Global Economic Divergence, 1600–1850 (Cambridge: Cambridge University Press, 2011). Pramoedya Ananta Toer, Tempo Doeloe: Antologi Sastra Pra-Indonesia (Jakarta: Hasta Mitra, 1982), 9. My translation. See Adrian Vickers, A History of Modern Indonesia (Cambridge: Cambridge University Press, 2013), 76. See Isabel Hofmeyr, Gandhi’s Printing Press: Experiments in Slow Reading (Cambridge, MA: Harvard University Press, 2013). Henry Yule and A. C. Burnell, “Introductory Remarks,” in Hobson-Jobson: A Glossary of Anglo-Indian Colloquial Words and Phrases and of Kindred Terms, Etymological, Historical, Geographical and Discursive (London: John Murray, 1903), xv–xxv, xv.